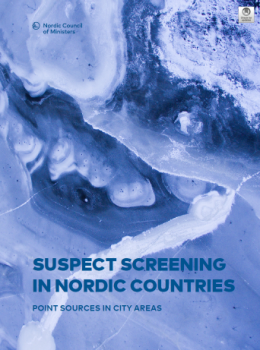 “Suspect screening in Nordic countries – Point sources in city areas” summarises the findings of new pollutants in a survey commissioned by the Nordic Screening group (nordicscreening.org). The analyses were done by a consortium of Nordic laboratories, consisting of NILU-Norwegian Institute for Air Research, Norwegian Institute for Water Research (NIVA), and Umeå University Department of Chemistry. The study was done as ‘suspect screening’ which is based on a technique where environmental pollutants are identified without a preceding selection of the compounds of interest. This technique was used in order to discover pollutants of emerging environmental concern in the Nordic environment which we might have overlooked until now. The study included suspect screening analysis of effluent water sample from wastewater lines, in each Nordic country. In addition, sediment and fish from wastewater receiving water bodies were analysed. Numerous industrial additives were found in sediment, water and fish samples. These were for instance phenols, UV-stabilizers, antioxidants, and plasticizers of the phthalate-type. Also a benzothiazole compound (2-methylthiobenzothiazole, MTBT, CAS: 615-22-5) was frequently found in all sample types and in high concentrations. 2-Methylthiobenzothiazole is a degradation product of mercaptobenzothiazol (MBT, CAS: 149-30-4), which is used in vulcanization of rubber. MTBT has earlier been detected in other screening studies in water and other abiotic samples, however, to our best knowledge not yet in marine biota.